This is an absolute huge pickup for the Gamecocks 2014 Class. Abu can come in and make an immediate impact on the defensive line. Standing 6'5" and 315 lbs he's very fast and agile for a guy his size. A truly dominate DT is very hard to come by and we feel like Abu can be just that, dominate. Lamin is rated at four stars and attends Fort Scott Community College in Kansas. He has ties to the Carolina's having graduated HS at Trinity Christian in Fayetteville, N.C. in 2011. Abu also played a season at Gray Military Academy before transferring. He has had offers from pretty much every school in the SEC. 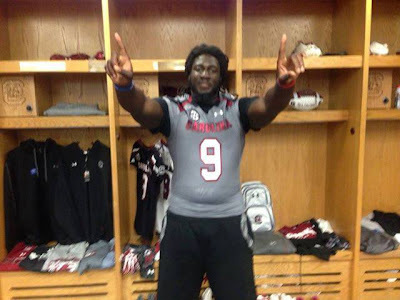 Find out why he chose to commit to South Carolina and more in this On The Block segment. BCB: Tell us about your relationship with Coach Adams, what made him stand out above other Coaches? AL: "He has success with Junior College athletes, he's a great coach on and off the field. He talks to me more than just about football." BCB: What's your number one goal your first year at South Carolina? AL: "Obviously to play and play at the highest level but I plan to dominate and play hard and take over games. I want to get after the QB, a lot." BCB: What South Carolina game would you like to attend the most this upcoming season? AL: "South Carolina vs Clemson"
BCB: Has Spurrier reached out to yet, if so what advice did he give you? AL: "He's talked to me, he's excited about me being a Gamecock. He said he knows schools are still going to recruit me and try to bad mouth SC." BCB: Being recruited out of high school and out of JUCO, is there a big difference in the process or fairly similar? AL: "I wasn't a highly recruited player out of high school. I was getting recruited by NC State and Miami. Now I'm getting recruited by the entire SEC. So, I feel like it's a big difference." BCB: What excites you the most about playing for a program on the rise and what separates South Carolina from the rest of the field? AL: "What excites me most is the Gamecocks are coming up and they are now getting national recognition. They are a team that is close to getting that SEC Championship and they can get there and win it. They have missed it the last couple of years by one game. BCB: What legacy do you want to leave behind when you finish your career at South Carolina? AL: "I just want to be known as one of the best defensive tackles to do it at South Carolina. I want to be great." BCB: A lot of recruits talk about your speed and agility for a guy your size, what do you think is the best part of your game? AL: "The best part of my game is getting up field and making TFL's, (Tackles for losses) as in hitting the RB or QB. I just get after it." BCB: Spurrier always talks about doing things that has never been done at South Carolina, did that factor is in your decision to commit to the Gamecocks? AL: "Yes it did and South Carolina is now on the stage to do just that." BCB: What's one of the craziest things that has happened during your recruiting process so far? AL: "The craziest thing that has happened has to be a fan trying to come pick me up and bring me to their school to check it out." BCB: What is something you want all of Gamecock Nation to know about Abu Lamin? AL: "I just want Gamecock Nation to know, it's time and as long as they have me I'm going to give it my all and give the fans what they want, Championships."